While a pregnant Nora relaxes in her best friend’s Bucks County pool, she doesn’t have far to look for her next big story. A Broadway show is in rehearsal next door at the home of the legendary late composer “Toodles” Tuttle. His diva widow, Boom Boom, reigns over his estate with an iron fist. She has also racked up a chorus line of enemies, so the old broad’s death is a hotly anticipated event. But imagine everyone’s dismay when it’s her beloved daughter, Jenny, who drops dead just as the lights are set to go on for the lucrative new Toodles musical. Like her heroines the Blackbird sisters, Nancy Martin comes from a distinguished Pennsylvania family whose ancestors include Betsy Ross, a hanging judge, and a signer of the Declaration of Independence. 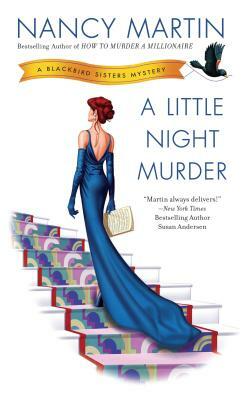 Her Blackbird Sisters mysteries include Little Black Book of Murder and No Way to Kill a Lady.